The whole ‘zombie apocalypse’ scenario has been done before, but it’s always more terrifying when the zombies aren’t just shambling fragments but instead super-powered beasts. Years ago, a terrible parasitic disease known as ‘Gastrea’ appeared, infecting creatures of all kind and morphing them into crazed beasts. Humanity, faced with this impossible onslaught, constructed cities protected by enormous monoliths constructed out of varanium, the only material harmful to the diseased. However, some Gastrea occasionally breaks through the barrier, requiring the creation of CivSec agents. Teams of varanium-wielding adults along with the ‘cursed’ children born at the start of the disease’s spread with immunity to Gastrea form these units and combat the monsters. Fans of fighting shounen or post-apocalyptic scenarios might find Black Bullet appealing. Black Bullet promises a unique take on the post-apocalyptic ‘zombie’ genre, and in that regard it most certainly delivers. If there is anything to be said for the series in this first volume, it is that the initial premise seems to be interesting: the virus ‘Gastrea’ turns creatures into grotesque monsters, and humanity is living behind walls of material deadly to the creatures. When the occasional monster manages to break through this barrier, CivSec agents, teams of one ‘promoter’ and one ‘initiator’, have to hunt it down. The dynamic between protagonist Rentaro and his initiator Enju has a very good setup to be unique and interesting, but unfortunately much like most of the other aspects of the volume, the relationship is poorly handled. The most egregious and off-putting of Black Bullet’s issues is Rentaro and Enju’s interactions, primarily because the 10-year-old Enju is constantly making not-so-vague sexual innuendos between the two of them. Needless to say, this is very creepy for most Western readers. However, the big problem is that while the loli fanservice seems to be the most apparent issue from the get-go, the truth is that it is merely scraping the surface in what is a particularly underwhelming narrative that seems to squander quite a bit of potential the premise has thus far. The story really is all over the place. The volume begins with Rentaro on a mission to exterminate a Gatrea-infected creature who has broken through the barrier. Within the first dozen or pages, the main villain is introduced and quickly exits, never to be mentioned again for the rest of the volume. This more or less encapsulates my primary concern with the narrative: it seems to kind of go off in different directions frequently without actually providing a satisfactory amount of page space for any of them. It’s less that the entire work is completely off and more that everything it does feels like it isn’t enough before trying to do something else. There is one other particularly difficult pill to swallow in the form of suspension of disbelief. In attempting build this post-apocalyptic society, it feels like author Shiden Kanzaki decided he wanted certain things to happen, and instead of finding good ways to justify the way things are, we as readers just have to accept it for how it is. To give an example, the initiators seem to be feared and reviled by the general population for their exposure to Gastrea, despite being little kids and one of the only sources of containment for the disease. Many of these issues could have easily been presented better if more details were given, but instead they just feel a bit strange and unnecessary. I think Black Bullet’s biggest problem is less that there is any one issue that breaks down the quality of the story, but rather that a series of poorly-chosen methods of storytelling mix together for what is altogether an unsatisfying volume of manga. That being said, I do think that it is perfectly possible for the series to turn it around with future volumes if the plot becomes more focused and the story relies less on unsavory tropes. Black Bullet Vol. 1 was published by Yen Press on September 22nd, 2015. Authored by Shiden Kanzaki and illustrated by Morinohon, the series is currently ongoing and published by ASCII Mediaworks’ Dengeki Bunko imprint. First published in Japan on August 27th, 2012, four volumes were released before the adaptation concluded, with volume 2 scheduled to be published in English on December 15th, 2015. 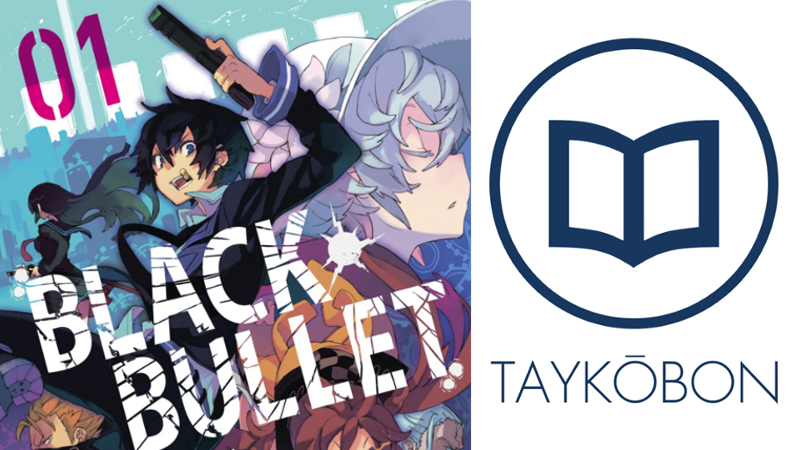 For more reviews, keep an eye on AniTAY as well as Taykobon, our page for reviews of manga and light novels. You can also follow us on twitter @taykobon for more updates! If you’ve read this work or have any questions or comments, we would love the hear from you in the comments below!